Esperanza Spalding performs at the 2011 Montreux Jazz festival in Switzerland. Pop fans of a certain age may only remember Esperanza Spalding as a spoiler, the interloper who once robbed an obsessively worshiped teen idol of his Grammy. The year was 2011. Spalding, then 26 years old and little-known outside jazz circles, had been nominated in the coveted best new artist category alongside Drake, Mumford & Sons, Florence + the Machine and Justin Bieber, the obvious favorite that night. No one expected her to win, least of all herself. But the upset was less shocking for the vitriol of spurned Beliebers— of which there was plenty — than as the first and only time the award has been given to someone who self-identifies as jazz artist. Spalding has undeniably made her mark within that male-dominated, musically conservative field. At the same time, she's also shown her capacity to operate irrespective of its borders, an unusual achievement irrespective of her gender. She didn't exactly come out of nowhere. A native of Portland, Ore., Spalding played classical violin as a child and gigged in an indie band on bass as a teenager. She graduated from the Berklee College of Music in only three years, becoming, at the time, the youngest instructor in the school's history at the age of 20. By the time of her Grammy nomination, she'd already recorded three albums: Junjo (2006), an offering of breezy originals and standards; Esperanza (2008), a garland of Afro-Latin and Brazilian influences; and Chamber Music Society (2010), a well-tailored concert program featuring strings. Three more have followed since then: Radio Music Society (2012), a collection of hummable, danceable, radio-friendly tunes that won a Grammy for Best Jazz Vocal Album; Emily's D+Evolution (2016), an Afrofuturistic landscape of complex, groove-oriented compositions; and the unprecedented Exposure (2017), created in just 77 hours while streamed on Facebook Live. It's tempting to think of Spalding as a prodigy. Drummer, composer and producer Terri Lyne Carrington, who first met Spalding during those early Berklee years, prefers a different term: "I call her a genius every chance I get." "If we go back in the music's history," explains Carrington, who is well-versed in women's struggles in jazz, "there are very few people who are accomplished in all of the areas that Esperanza is. She's a virtuosic bass player. Her voice is capable of acrobatics. Her compositions are not easy. Her lyrics are poetry. And she puts it all together in a way that's commercially appealing. She's setting an extreme example for young women in music." Similarly, few have traversed such diverse stylistic terrain at such a young age, a feat Spalding has accomplished in spite of being policed by jazz purists. At times, they've grumbled that her music is too immature or too accessible (read: too playful and too joyful), a stance so predictable that it says more about the intractability of critics than the music. In jazz's time-honored apprentice system, "sidemen" ready themselves by playing in the bands of more seasoned leaders, ranks that women can still find challenging to enter. Although Spalding has performed, and continues to, in groups such as beloved saxophonist Joe Lovano's Us Five, she has leapfrogged through the expected dues-paying to make her own music. Her self-described "f*** it, whatever" attitude, the result of having already faced down a lifetime of low expectations, has served her well. At the beginning of her career, Spalding recently told me by phone, she was considered "a hot — hey, I'm still hot — brown lady of indeterminate ethnicity. There was a novelty that drew people to me as an entity before the merit of my work could make a place for itself. Many times people didn't expect anything from me because I was a pretty girl. And those in the industry didn't care how I played because they saw I was marketable." If Spalding assembled her musician's toolkit by mastering classical music, jazz and its Afro-Latin counterparts, she came into her own by threading those influences through the R&B she heard on the radio when she was a kid: Sam Cooke; Smokey Robinson; Earth, Wind & Fire. That fusion was already audible in Esperanza's funky bass lines, but has taken off in her later projects as she has come into the orbit of black popular musicians. A favorite of the Obamas, Spalding performed "Overjoyed" at the White House in tribute to Stevie Wonder in 2009, sparking a relationship between the two artists. Prince invited her to jam, and she played on his BET Lifetime Achievement Award tribute and opened for him on tour in 2011. (When I saw the show, I couldn't help checking out Questlove seated at the end of my aisle, his head bobbing to Spalding's "I Know You Know.") Radio Music Society featured a guest appearance by Lalah Hathaway; Q-Tip produced a pair of its tracks. Spalding appeared as a guest on Janelle Monáe's 2013 album The Electric Lady and Bruno Mars' 2012 Unorthodox Jukebox. These artists clearly acknowledge Spalding as a talented peer. The benefits of their creative exchanges may seem obvious to those outside of jazz, but they run contrary to jazz's often elitist musical culture. They come at a time when the form has its sights set in the rearview mirror, when most young artists are "trying to sound like they peaked in 1942 or 1957," says Carrington. Spalding, instead, has more in common with two of jazz's greatest living composers: pianist Herbie Hancock and saxophonist Wayne Shorter, co-founder of the superband Weather Report. (Incidentally, Spalding is writing the libretto for Shorter's opera Iphigenia, premiering in 2020.) Alumni of Miles Davis' second great quintet, the two men pioneered fusion starting in the 1970s, walking paths that brought them to audiences for commercial music. For example, Spalding's "Good Lava" from Emily's D+Evolution demands that we "See this pretty girl, watch this pretty girl flow"; grungy guitars mirror bass in shape-shifting, Tetris-like configurations punctuated by ear-popping, overdubbed vocals (think "Bohemian Rhapsody"). "Judas" wows with epic, rangey harmonies linked together by a recurrent, loping bass line. And, with its echoes of Joni Mitchell, "Earth to Heaven" splays a broken chorus across voices, guitars, bass and keyboards, interrupting serpentine melodies. A culmination of Spalding's work and influences to date, this is funk at its most serious-minded and compositional. But the ways in which Spalding's music are truly the most radical are perhaps the most easily overlooked: how her approach to singing and the substance of her playing challenge gender norms across styles. A slender reed of a woman who might still be mistaken for a teenager, Spalding possesses a voice that is agile and lithe, closer to Diana Ross, Roberta Flack (a closeted jazz musician) or Brazilian singer Elis Regina than to her jazz precursors. Spalding doesn't sing torch songs and rarely writes of romance. She doesn't attempt to reel in her audiences with flirtation. She chooses not to perform desire or longing, themes that fuel the most deeply held stereotypes of jazz women as singers who simply emote rather than perform with technical skill. That Spalding can sing with power and spirit while refusing to operate from a place of emotional want represents an enormous psychic shift within jazz, bringing the music in line with contemporary women's values. Likewise, her bass playing redefines that instrument through her penchant for lyrical invention. During the press party for Chamber Music Society, I remember overhearing one critic complain to another, "Well, she's no Paul Chambers," referring to the muscular Detroit bassist on some of Miles Davis' most famous albums. "That really ticks me off," Carrington responds, knowing there's no way to compete with dead legends. "Bringing a more feminine aesthetic into the music is mandatory at this point. Because Paul Chambers didn't get around the instrument the way she does. So she's not digging in as hard; it gives her a kind of fleeting emotion that is beautiful. He did not sound like a butterfly. And if you're saying that the bass cannot sound like a butterfly, that's bulls***." It's both absurd and completely predictable that Spalding's unconventional excellence would be threatening to those who would uphold the status quo through the bass. And it's tempting to write that she does everything Paul Chambers did except backwards and in high heels, because it's still gratifying to see women shredding ferociously on this instrument. There have long been female players with the chops to do just that: among them, late jazz bassist Carline Ray, session musician Carol Kaye, Tina Weymouth (Talking Heads), Gail Ann Dorsey (David Bowie), Sara Lee (Gang of Four, B-52s, Indigo Girls) and Meshell Ndegeocello, who herself deserves far greater recognition as an innovator. There's something particularly powerful about seeing a woman succeed — and succeed wildly, popularly — on the instrument. Like keyboards, the bass provides accompaniment. Like guitar, it can take pyrotechnic solos. But unlike these instruments, the bass is not optional. It can't be abandoned for the microphone or dismissed as an accessory. It is the foundation of any band: its rhythmic and harmonic center of gravity, its anchor. To claim the bass is to take on a role and occupy a register, one where we may have been blind to women's absence (such that it's easier to accept Meghan Trainor or Nicki Minaj adopting "bass" as a sexual innuendo than to envision a woman commanding the instrument). 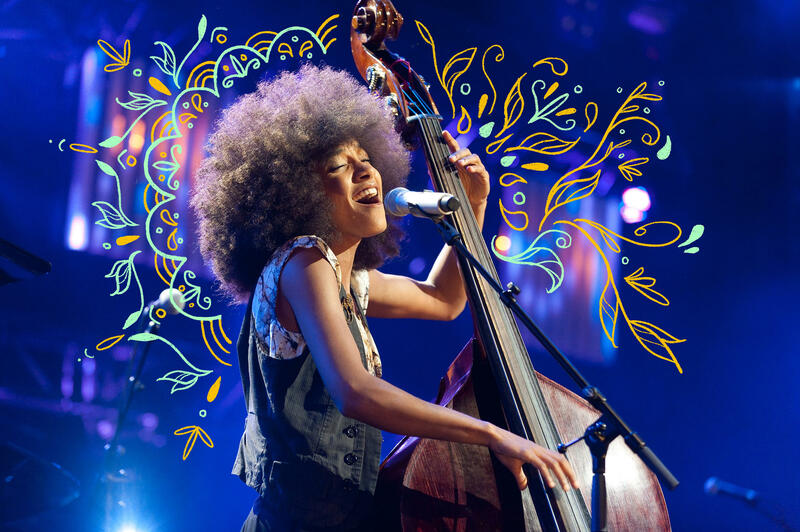 When we see Esperanza Spalding playing her instrument as she sings, in front of her own band, in the context of the new musical worlds she has created, we bear witness to a woman who is so completely in control of her own context that she dwells at the foundation on which it stands. Made visible, hers is leadership that cannot be denied.